The Low Tatras is about 80 km long mountain range, situated between picturesque valleys of the Váh and Hron river, in the East-West direction. Three peaks of the main comb reach the elevation of 2000 m. The highest are: Ďumbier (2043 m), Chopok (2024 m), Dereše (2004 m), Chabenec (1955 m) and Kráľova hoľa (1948 m). They all offer breathtaking view at Slovak mountains and valleys. The Low Tatras are the second most visited mountains in Slovakia (after the High Tatras). A large number of new hotels, camping sites, ski lifts and other tourist services arose in this region in the last years. Despite this fact, real primeval forests with a lot of wild animals (including bears) still exist especially in the eastern part of the Low Tatras, in the area between Čertovica and Kráľova hoľa. In the almost untouched forests you can choose from numerous interesting hikes. The path between Chopok and Čertovica is very attractive and popular between visitors. It offers wonderful views at valleys in the north and in the south. Majority of chalets and hotels are centralised in the middle of the Low Tatras, in two valleys bellow Chopok. It is the most beautiful part of the main mountain-comb. In the northern part, there is the Demänovská Valley with recreational settlements at the beginning of the valley, in Lúčky, Záhradky and in Jasná. In the south, there is the Bystrá Valley with Tále, Srdiečko and Kosodrevina settlements as well as a recreational village Mýto pod Ďumbierom. There is another ski-centre in the middle of the Low Tatras in Čertovica saddle. You can arrange accommodation in the Bocianska Valley or in the villages Vyšná Boca and Nižná Boca. The most important tourist centre and a suitable starting point for the hikes in the western part of the Low Tatras mountains is Donovaly. In the eastern part dominate the villages Liptovská Teplička and Telgárt. The most important tourist centres for the hikes to Chopok peak are: from the north (Demänovská Valley) - Liptovský Mikuláš; from the south (Bystrá Valley, Krpáčovo) - Podbrezová and Brezno. A new administrative district, Demänovská village, arose from all the tourist settlements situated in the Demänovská Valley. The Low Tatras even offers lots of swimming facilities, such as (Bešeňová, Čierny Váh, Krpáčovo, Liptovská Mara, Liptovský Ján, Aquapark Tatralandia, Tále) and visits to the following caves: Bystrianska jaskyňa (Bystrianska Cave), Demänovská ľadová jaskyňa (Demänovská Ice Cave), Demänovská jaskyňa slobody (Demänovská Cave of Freedom), Jaskyňa mŕtvych netopierov (Cave of Dead Bats), Važecká jaskyňa (Važec Cave). The Low Tatras with the area of 810,95 km2 became a National Park in 1978. 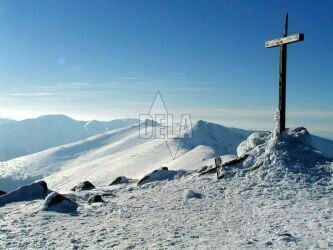 This is my web-site devoted to the Low Tatras National Park. I cordially invite you to visit this beautiful part of Slovakia.